Have you ever wondered why they call it Monkey Bread? I have, so I looked it up and didn’t really get a satisfactory answer. 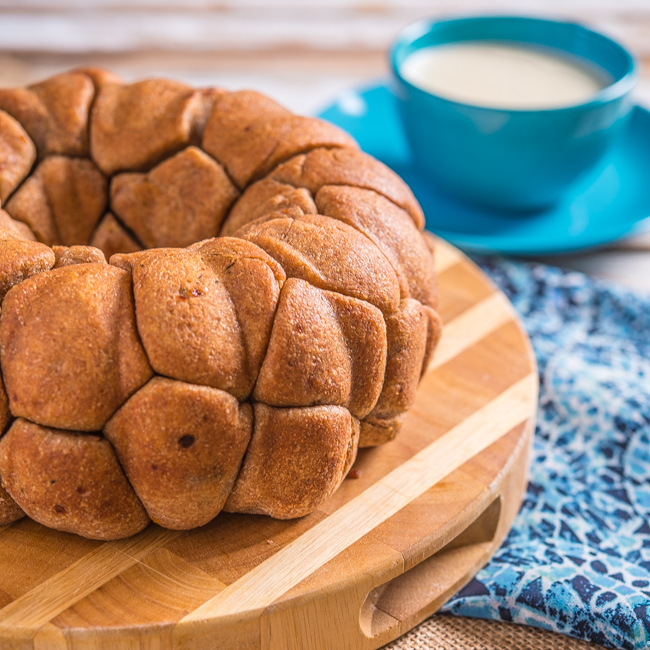 Monkey Bread, typically a sweet and gooey pull-apart pastry baked in a bundt pan, is of uncertain origins. Probably created in the U.S., it first appeared in magazines and cookbooks in the 1950s. Wikipedia says that it may have gotten its name because it resembles a monkey puzzle tree. I googled pictures of that tree and I just don’t see the resemblance. Nonetheless, Monkey Bread in its myriad variations is a delicious and fun-to-make dish. I usually opt for savory over sweet, but I love the concept of pulling off a little packet of goodness, dipping it in a yummy sauce, and eating it with my fingers. So, I decided that I’d break with tradition and make a savory monkey bread. I’ve seen recipes for a cheese and pepperoni version with a marinara sauce but for this post, I used some of my very favorite ingredients. Each little packet of dough, stuffed with chicken sausage, spinach, sun-dried tomato, and Fontina cheese, is like a mini calzone. The Parmesan garlic dipping sauce makes a fantastic finishing touch. I’ve made dough for Chicken Florentine Pizza and Pear and Gorgonzola Pizza, but to save a little time in making this recipe, I bought Trader Joe’s whole wheat pizza dough. Precooked chicken sausages and frozen chopped spinach saved a bit of time as well. This recipe requires a little time to make the packets, but once you get a rhythm going, you can really crank them out. Before making the packets, make sure the spinach is completely thawed and well drained. The most effective way of draining spinach is with a clean dish towel. Place the spinach in the middle of a towel, gather up the sides around the spinach, and twist just above the spinach. All the liquid releases through the towel and you end up with dry and ready-to-use spinach. Make each packet with a ball of dough about an inch in diameter. Flatten the dough ball to a 2 1/2 inch disk, dusting with flour if dough is too sticky. Top with some spinach, a piece of sausage, a slice of sun-dried tomato, and a cube of Fontina cheese. The dough is fairly elastic, so pull the edges of the dough up and over the stuffing and pinch to seal. You should end up with about 45 to 50 dough packets. After all the balls are stuffed, brush with garlic butter and place in a bundt pan. After 30 to 35 minutes in the oven, serve with Parmesan garlic sauce and you’ll have a delicious party food or serve with a salad and it’s dinner. 2. Break off a 1-inch ball of dough. Flatten dough into a 2 ½ inch disk, dusting with flour if dough is too sticky. Top dough with a small amount of spinach, a half round of chicken sausage, a slice of sun-dried tomato, and a cube of Fontina cheese. Pull the edges up and and over the filling and pinch to seal the packet. Place on a floured baking sheet. Repeat with remaining dough and ingredients to form from 45 to 50 packets. 3. Melt 4 tablespoons of butter in a small skillet over medium heat. Add 3 cloves minced garlic and sauté for 30 seconds. Remove from heat. Using a basting brush coat the inside of a bundt pan with butter. Brush each dough packet with garlic butter and place in bundt pan. When all the packets are in the pan, gently press down on packets to create a semi-flat surface. 4. Bake for 30 to 35 minutes or until dough is golden brown. Let cool for 10 minutes. Place a plate upside down on top of bundt pan and flip to release the bread. 5. Melt remaining 4 tablespoons butter in a medium sauce pan over medium heat. When butter is melted, add 3 cloves minced garlic and saute for 30 to 45 seconds. Add flour and whisk for 1 to 2 minutes. Slowly add milk, whisking constantly until milk is full incorporated into butter and flour. When sauce is thickening, add cheese and salt and whisk until cheese is melted. Remove from heat. 6. Serve warm monkey bread immediately with cheese sauce. Once again, I am amazed!!!! I’ve never seen a savory monkey bread and I know I’ll never see one as amazing as this. WOW! I would eat half of the bread…okay, okay, I could totally eat it all myself. ;) What a great recipe, thanks for sharing Bill! Wow, I love that you made a savory version of Monkey Bread! I can’t believe all of that is in one of those little bites. 🙂 I have always wondered where the name came from, but I guess it doesn’t matter as long as it tastes good! You knocked this one out of the park. Love monkey bread. What a fantastic idea for a party appetizer! It looks so delicious and fun to eat! It is fun to eat and I ate way too many of them! 🙂 Thanks for stopping by, Susan! I’ve also wondered how this got its name, and looked it up too. With no better luck than you — its name is still a mystery to me. It’s a fun bread, though, and I really like your savory version. Great tip on how best to defrost spinach! Good post — thanks. I love that you used TJ’s pre made dough! There is nothing about this recipe that my family wouldn’t love, love, love! I’m learning to simplify, Kathi! I’ve been accused of the opposite so it’s my mission to take some shortcuts! Thanks for the visit!